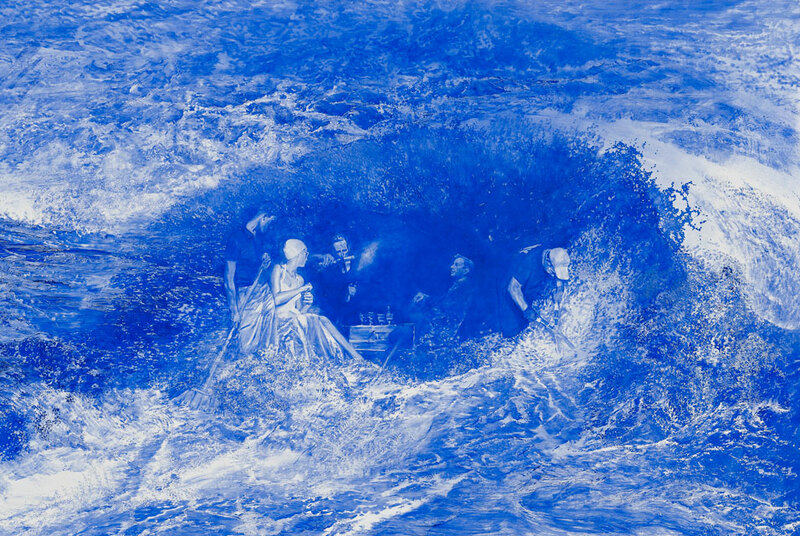 Mark Tansey, Recourse, 2011. Oil on canvas, 65 x 99 7/8 inches, (165.1 x 253.7 cm). Photo: The Douglas M. Parker Studio, courtesy Gagosian Gallery. BEVERLY HILLS, CA.- Gagosian Gallery is presenting an exhibition of recent paintings by Mark Tansey. At first glance, Tanseys distinctive paintings appear to depict straight narrative scenes but closer scrutiny reveals an undercurrent of quirks and visual puns. By thus manipulating the conventions and structures of figurative painting, he creates corollaries for literary, philosophical, and historical concepts in visual allegories about the nature and implications of perception, meaning, and interpretation in art. Growing up in a family of art historians, Tansey weaves an extensive knowledge of art history into his paintings through an exacting and time-intensive process. His images derive from an encyclopedic archive of magazine, journal and newspaper clippings accumulated over many years, as well as from his own photographs. Selecting source images, he continuously photocopies them, stretching, rotating, and cropping them in the process. This results in a collage that serves as a preliminary study for a painting. Rendered in a single luminous hue, Tanseys paintings have a precise photographic quality reminiscent of scientific illustration, which he achieves by applying gesso to canvas then washing, brushing, and scraping paint onto the smooth and unyielding surface. For the works in the exhibition, Tansey has selected ultramarine, a color that combines the depth and complexities of black with the lightness and transparency of blue, and which imparts the historicizing feel of blueprint. His subject matter has expanded to include figures from political, philosophical, and economic history, as well as from art history. In EC 101 (2009) he traces the lineage of economic theory by inscribing human faces into a creviced mountain, à la Mount Rushmore, a structural device that recalls his earlier use of landscape to blur the traditional distinction between figure and ground. At the top of the mountain are classical economists such as David Hume, Adam Smith, and John Stuart Mill while the heterodox economists such as Karl Marx, Joseph Stalin, and John Maynard Keynes are at the base. In a parallel narrative, Dante and Virgil stand in the lower half of this painting, which is a reversed image of the mountain. In The Divine Comedy Virgil guides Dante through Hell and Purgatory while Beatrice guides him through Heaven. Mark Tansey was born in San Jose, California in 1949 and lives and works in Portsmouth, Rhode Island and New York City. His work is in major collections including Modern Art Museum, Fort Worth; Walker Art Center, Minneapolis; Broad Art Foundation, Los Angeles; and Smithsonian American Art Museum, Washington D.C. Solo exhibitions include Kunsthalle Museum, Basel (1990); Mark Tansey: Art and Source, Seattle Art Museum, Washington (1990, traveled to Montreal Museum of Fine Arts, Canada, St. Louis Art Museum, Missouri, Walker Art Center, Minneapolis, Minnesota, List Visual Art Center, MIT, Cambridge, Massachusetts, and Modern Art Museum of Fort Worth, Texas through 1991); Fisher Landau Center for Art, Long Island City, New York (2005) and Museum Kurhaus Kleve, Germany (2005, traveled to Württembergischer Kunstverein, Stuttgart, Germany).